It's been a while, I know. A little shy of a year since I've put anything in this space other than a few drafts that were forgotten about months ago. whoopsie. In truth, I've had an itch to start blogging again for the last few months. As the renewal date on my domain approached, I indecisively weighed whether to pay for this empty space on the internet. Would I let it sit idle again or could I give it a few pumps to the chest and breathe life back into it? As I mulled over my options, a memory came to the surface--a tiny hope of what I'd always wanted this space to be. Just a blog...about life--MY life--as told through food. A space to write some thoughts and share what's going on, as if you were sitting in my kitchen with me and we were gabbing away like the dearest of friends. I never set out to teach anyone to bake or to reinvent the chocolate cake, though somewhere along the way, that's what got in my head. I got a little too caught up in what everyone else was doing, and pressured myself into following that script. I got anxious about pageviews and popularity, how to get on the glamorous food sites, and how to make sure my posts were seen. I put way too much pressure on myself to create brand new recipes or adapt existing ones enough to call my own. I got such anxiety about being original that my perfectionism paralyzed me from writing a damn thing. With my doubts fermenting I was about ready to pull the plug until I came across a post from my lovely friend Kris, who recently returned to blogging after a few important and wonderful changes to her life. Her post resonated with me so much--the embarrassment of abandoning a space I had worked so hard to create, returning to her core values, remembering why she started blogging, and wanting to move forward in an authentic way. Though my life hasn't taken the same path as Kris's, I realized that I've changed a ton since starting this blog too and it didn't feel quite right to keep this thing going without respecting that. If we're being honest? I started this blog to slough off the academic-writing-voice I'd gleaned from 15 years of penning formulaic essays. I wanted to find my authentic voice and invite that version of me over for a slice of cake. In the last few years, I've done a lot of work to be completely comfortable with who I am--to love and accept myself, flaws and all. I couldn't have done any of it without this space, where I started to chip away at habits and ideas, and question so much of how I was living life. It was my space to unthink, overthink, and get unstuck. After a bit of reflection, I realized it'd be a disservice to that space, the changes I've made, and to younger me, to uproot everything and leave it behind. So, with that in mind, I hope to spend a little more time here doing the things that bring me joy--trying to take better pictures of food, sharing links that inspire me, and letting you into my life, one blog post at a time. In the spirit of inviting younger Kelly to the table for some tea & cake, I'm sharing this chocolate babka I made earlier this week. With its uneven chocolate swirls and a quick wave-hello of cinnamon, it's beautiful and delicious -- imperfections and all. 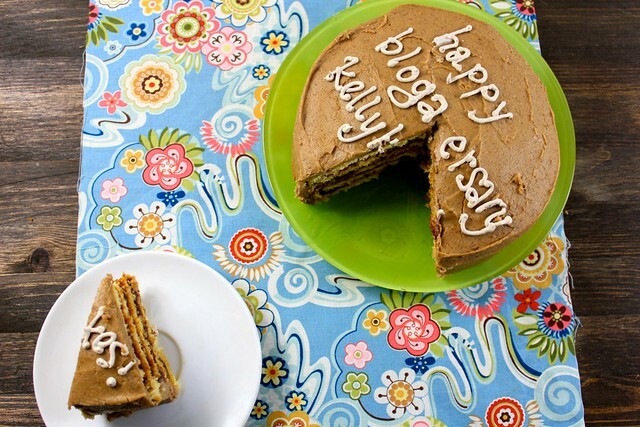 A Nod to My Roots: Apple Butter Dobos Torte with Spiced Caramel Icing for My Blogaversary & a Giveaway! I am self-reflective almost to a fault. I look back at my life, my choices, my emotions all the time. I'd like to think this makes me a better person and that I keep making changes to get me on that path, but it seems the more I reflect, the more I realize how many aspects of my life could use a tweak, a nudge and sometimes even an overhaul. Take this blog, for example. It wasn't always this riveting little piece of the internet you see before you. In fact, it isn't even my first blog. 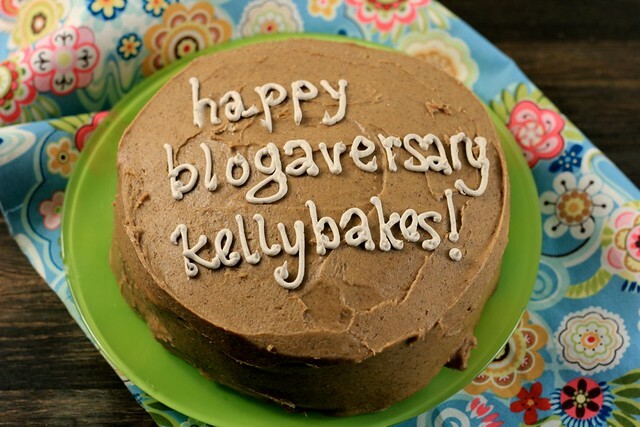 Before we dive into the fun stuff like giveaways, cake and presents, let's sojourn through my past awkward and unguided (and very apparently so) past incarnations of blogs. 2009 - Way More Than Cheesesteak - At this juncture, I was between going to pastry school and grad school but got accepted to the latter before I could apply to the former. Grad school proved to be nothing like I'd hoped or wanted it to be and I found solace standing tip-toe in front of my Kitchenaid, mixing, measuring and covering my galley kitchen in flour. what the blog actually features: photographic and descriptive evidence that I spent more time researching French pastries than French literary theorists. 2010 - No Small Potatoes - The summer I ate my way through Ireland and found wifi to tell you about it. what the title suggests: An effort to photographically chronicle all eating adventures through the Emerald Isle, while disproving stereotypes about Irish cuisine. what the blog actually features: For once, I was actually spot on. Good Irish food and large potatoes. highlights include: sprawling fields of green grass, cows, and the Cliffs of Mohr not captured: I return to the US and to WMtC lugging two suitcases, an oversized carryon, a purse and a bag full of Jameson, brown bread and Baileys bought at the airport, all while casually sipping an iced caramel macchiato and getting strange looks from everyone I encounter. 2011 - My first foodblogging conference! Here, I realized that there are people who are big deal bloggers, who take nice pictures, write well, have followers who aren't their mom (love you, mom!) and who have since become my friends :) After realizing that my blog was more about what I baked than actually eating in the city (ya know, because I lived in the 'burbs and all...), I decided to drop the whole what-I'm-eating-in-Philly gig and go with what I'd always wanted to do: narrate my life through food. ...so here we are. Present day. I haven't quite managed to execute that goal all the time. I often got caught up with wanting pretty pictures (hence the post dearth during the months I was sans camera) or feeling the pressure of needing to be like everybody else. Now that I have a shiny camera, I do still want pretty pictures (and I'm working on figuring out how to do that and it's certainly giving my ego a few knocks), but I think I'm finally comfortable with putting out content that's true to what I had in mind all along. That means telling my story primarily with words through the lens of food. That also means there might be more paragraphs than pictures and there may not even be recipes. I've realized that after grad school momentarily stole the joy out of writing, my main focus is putting confidence back in my voice (metaphorically and literally), rather than worrying about teaching y'all how to bake. So, as a nod to my roots, both personally and blog-i-torily (umm... go with me on that one...), I wanted to do two things. 1.) PRESENTS. That's right. Presents for me, presents for you. My present is coming on Thursday (more on that later!) Your present is a fantastic giveaway! The Philadelphia-area foodblogger, Iris McCarthy (@PalatePrincess) gave me two copies of her book, The Food Lovers' Guide to Philadelphia and I've got one that could be yours. (And who knows, maybe I'll even grab a bite with the winner if they're in town!) To enter, leave a comment with a favorite birthday tradition you have. For additional chances to win, you can like Palate Princess on facebook or follow her on twitter! (Just leave a comment and let me know that you've done so!) I'll use a random number generator to pick the winner on Thursday, November 1st. The winner will be notified via email. **Disclaimer: I was given two free copies of A Food Lover's Guide to Philadelphia; one to keep and one to give to a lucky reader. The opinions expressed here are (as always and forevermore) my own. The end. 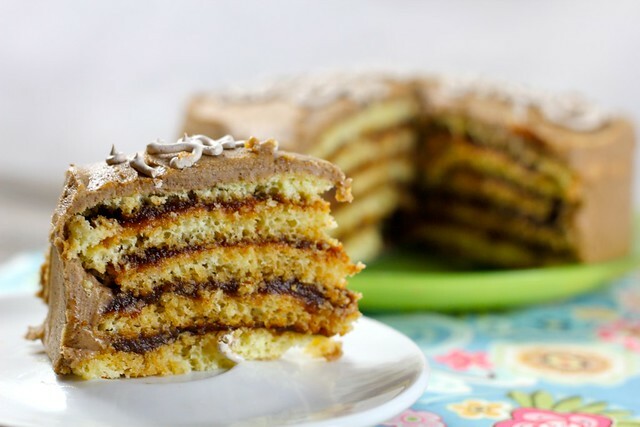 A traditional dobos torte is five layers of sponge cake with chocolate frosting in between. I made mine with 6" round layers because I wanted a personal-sized cake, but the original recipe called for 9" rounds. Because this cake is by no means traditional, you can either make the 9" rounds or the 6" and use the extra layers to make a taller torte! Position oven rack in the center and preheat oven to 400F. Using a round cake pan (9" for traditional torte, 6" for personal-sized), trace 1-2 circles onto parchment (1 for a 9" round, 2 for a 6"). Flip parchment over so that pencil side touches the cookie sheet, not the cake. In a mixer, beat egg whites to soft peaks then gradually add 2/3 C powdered sugar. Continue beating until whites become glossy, stiff peaks. Set aside. Beat together egg yolks, vanilla and remaining 2/3 C powdered sugar on medium - high until the yolks turn pale yellow and thickens. Stir 1/4 of the beaten egg whites into the yolks to lighten them then, using a rubber spatula, gently fold in the remaining whites. 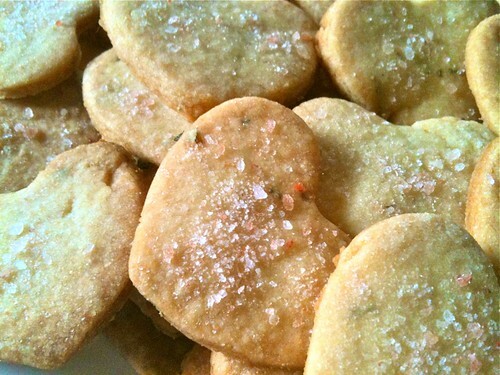 Combine flour & salt. Sift half the flour over the eggs and carefully fold in. Continue with the remaining flour. Using a 1/2 C measuring cup, scoop batter onto one of the baking sheets in the center of the traced circle. Using an off-set spatula, spread the batter into an even layer, filling the traced circles. Place in oven and bake for 5 minutes or until the edges are slightly browned and the center springs back when poked with your finger. While this sheet is baking, repeat the process with the next sheet (trace circle(s), flip parchment over and fill with batter). When the first sheet is done, invert to a flat surface and ever-so-gently remove the parchment sheet from the back. Slide the cake back onto the paper and let it stand until cool. Let the baking sheet cool and line with new parchment. Repeat tracing & baking steps with remaining batter. In a bowl, combine powdered sugar and spices. Set aside. Melt butter in sauce pan. Add brown sugar, salt and 1/4 C half and half over medium-low heat and cook until sugar dissolves (approx 2-3 minutes). Remove from heat and add vanilla, stirring to combine. Pour caramel into powdered sugar and beat with hand beaters, adding half and half until the frosting reaches desired consistency. Spread a small dollop of frosting n a cardboard round or plate. Place one layer of sponge cake on top. Using small offset spatula, spread a thin, even layer of apple butter onto sponge cake, stopping just before the edges. Top with another layer of sponge cake. Repeat process until there are five layers of sponge cake, but add apple butter to the top layer. Use small offset spatula to frost the cake. Slice, admire your handiwork & enjoy! intentional words, as told through donuts. The thing is, I know a good donut. 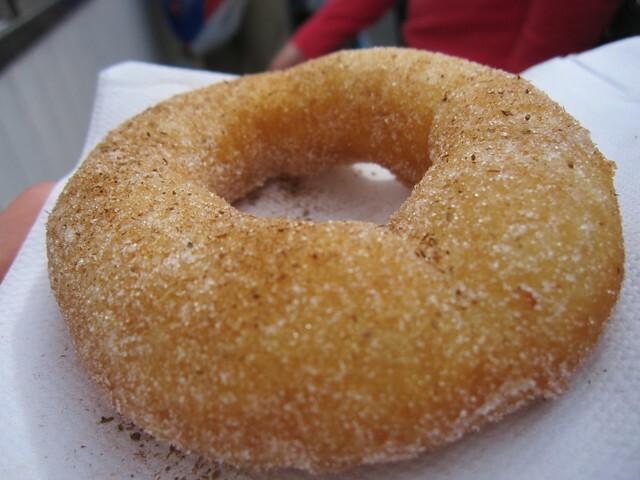 I wasn't a fan until I studied in Galway and experienced hot donuts that were fried golden brown, simply coated in either cocoa or cinnamon sugar, but had the most ethereal texture I've ever experienced. They were so soft that they nearly melted in my mouth. On my last day, I bought a dozen and shamelessly ate each one through tears [half for leaving Ireland and half for leaving the Donut Man]. 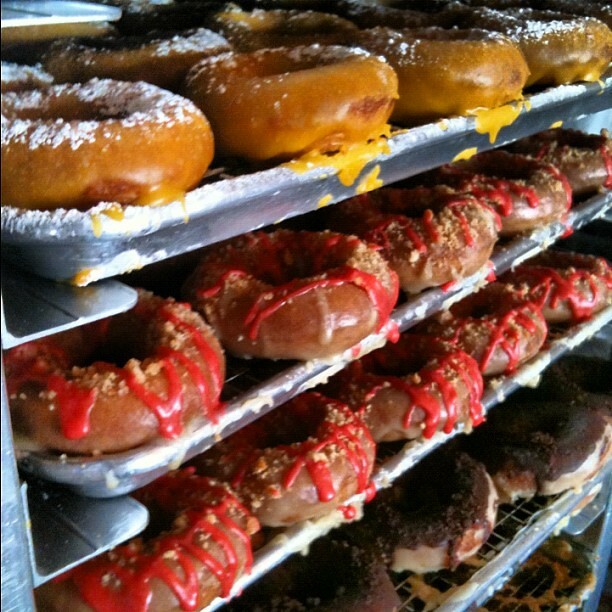 And, for the past few months, I've been spoiled by working at Federal Donuts, meaning that I willingly get up at 5:30am on Sundays and bike halfway across the city to be surrounded by flavor combinations of halvah pistachio, pomegranate nutella, chili mango, mandarin coffee, and strawberry rhubarb pie. 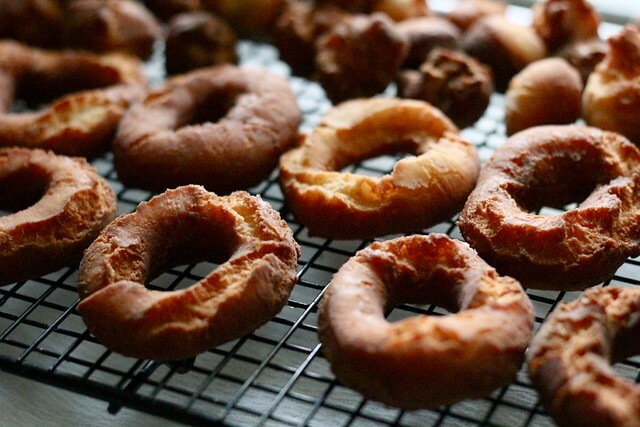 The donuts are cakey and soft and hold up well to glazes, but fried fresh and sprinkled with sugar spice combinations like vanilla lavendar or appollonia spice (think: notes of orange blossom, cocoa powder and clove on a just-fried donut), they simply shine. My donuts were not good donuts by any means. I tried to pass them off by posting a picture on instagram with all of the ingredients listed, but they were too dry and the flavor just wasn't there. I had written down the recipe with hopes that it would be good, but it wasn't worth sharing. I was going to start this post with an apology about how I'm not going to include a recipe, but then I realized that saying I was sorry would be a terrible idea. Ya see, I am a chronic apologizer. I'm not sure when it started, but it became terribly apparent recently... so much so, in fact, that when I let an "I'm sorry!" slip, my coworkers will say, "You should be!!" just to show me how unnecessary it was to say. Apologizing isn't a bad thing when it's done with care and purpose. But, when it's overused, it seems to lose it's value. I've become so desensitized to the phrase "I'm sorry" that I worry that other people have given it a patterned usage too. A friend apologized to me for something pretty serious recently and I couldn't help but wonder if they had just said the two-word phrase because it was the appropriate thing to say or if they had really felt remorse for what they'd done. It's not that I don't feel bad about things I sorrybomb--for getting in folks' way, for interrupting someone, for assuming things, for not bringing enough cupcakes to share with the group [okay maybe not that last one...]. It's moreso that I shouldn't feel as bad as I do and I shouldn't waste an apology on things that could easily be addressed instead with a "mea culpa," "pardon me," or a butterknife [ya know, to cut that cupcake in half]. The more I thought about it, the more I realized that this year's "I'm sorry" was last year's "it's fine." I'd say that whenever bad news was delivered, regardless of whether someone was giving it to me or if I was talking about myself. It was my way of not dealing with the gravity of the situation: "I have two flat tires, but it's fine." "My debit card was stolen, but it's fine." I even said it to a guy I was dating as he broke things off with me. He responded with, "You say that a lot, but it's really not fine." He had a point. It's not fine to abuse words. I'm guilty of it in other areas too. I'm sure we all are to some degree. So, to me and you and anyone who's read this far: When asking someone how they're doing, ask because you care about the answer [good or bad], not because it's polite. It took a lot to wipe "it's fine" from my vernacular, but I now I hate being asked, "How are you?" because I'm expected to say, "I'm fine," even when I'm not. Sometimes it seems as though people would rather I responded with empty words so they wouldn't have to get a taste of what's really going on in my life. So, if you ask, follow through on what you say. Be prepared to listen. If you say you're sorry, also say what you're apologizing for. If you're saying it for good reason, it will show the other person that you're being intentional and care about making amends. If you're an overapologizer, it'll show you some of the ridiculous things you apologize for. 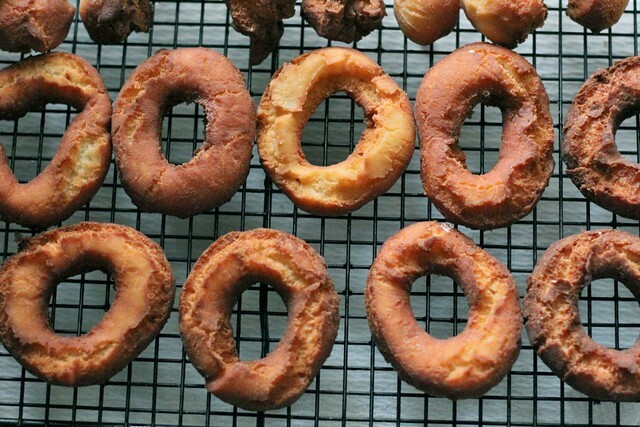 I'm not going to apologize for lackluster donuts and a recipe-less post. 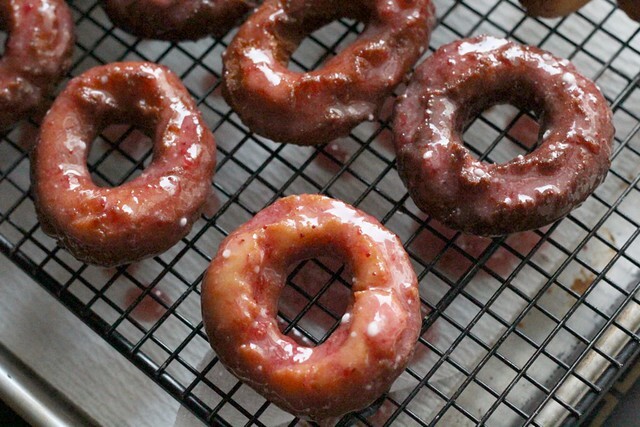 Sure, my donuts looked the part of a delicious homemade donut--they had the shiny pink glaze and the all-star list of ingredients--but the ratios were off, leaving them as empty in taste and as off in texture as my words had been in meaning and value. For that last part, I am actually sorry. I need to confess something: I'm not a good cook... I should be a lot better given the fact that my favorite childhood memories were formed sitting on a stool, legs dangling far from the floor, watching my dad prepare food for hours in the commercial kitchen he used for his catering business. I watched in awe as he'd stand over the stove with his hand on a pan, flick his wrist and make sauces dance and ingredients leap into the air, only to land safely back into the pan moments later. Last week, I stood in front of my stove with my hand on pan that had all the markings of a slightly charred meal. I thought back to my father's finesse and I wondered whether it would be worth it to try to scrub away the burnt-on mess or if I should just give up and throw the pan away. Prolonging a decision, I sighed and walked out to my garden to get away from the smoky smell of my kitchen. As I sat on my patio steps looking out at the tangled mess of overgrown plants in front of me, my dad came back to my thoughts. As a kid, I remember him haphazardly throw seeds out into the perpetually-tilled rectangle of soil that was his garden and, within weeks, he'd have healthy, lush plants that fed our family until the chill of fall. His tomato plants would tower above my head and his squash stalks would sprawl out into the grass, dotting our lawn with bright yellow veggies that I would be tasked to collect in a wicker bread basket. 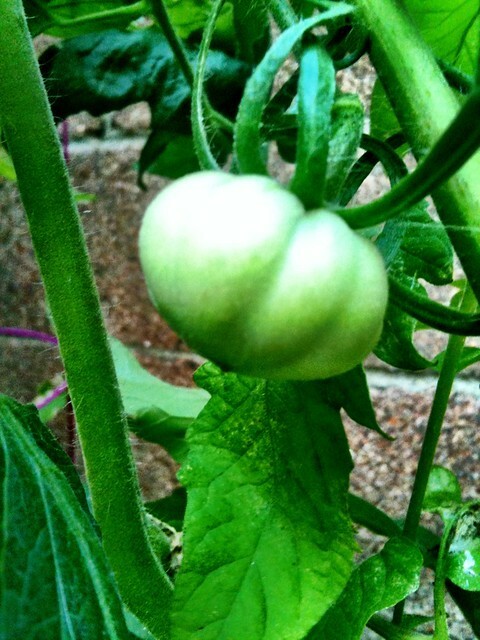 I started my garden with the best of intentions. I remember how happy I was being with my dad as a child, crouching in the dirt to pull weeds and peeking under leaves to see if anything new had sprouted. I went to an urban farm and bought kale, cucumber and herb plants. I bought broccoli, sweet potato and a host of heirloom tomato starts. I even transported my blueberry bush and raspberry shoots down from my mom's house in Connecticut. 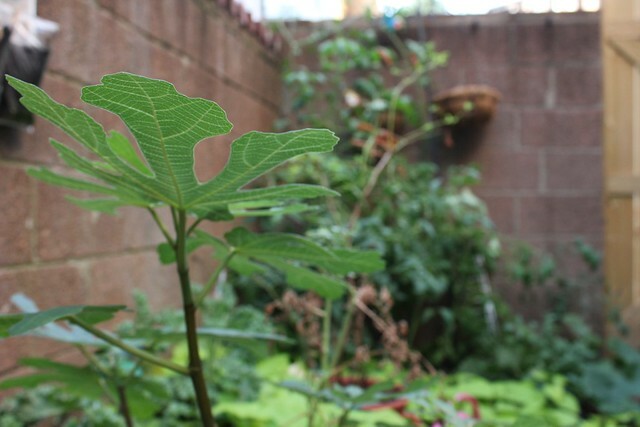 I had idealistic visions of nearly-zero grocery bills all summer thanks to an edible Eden in my back patio. What I got instead was kale-destroying caterpillars, a heatwave in July, fruit-less tomato plants and a big dose of reality. In some ways, I take after my dad. I look just like him, show affection through teasing, love to feed people and I have a knack for getting things to grow. What I never realized about my dad, however, was that despite being boisterous and extroverted, he has unspoken knowledge and quiet patience for things like cooking and growing food. For as much as I watched him and shadowed his every move as a child, I never thought to ask how to tell when chicken is done or how to properly prune tomato plants. Even in my clearest memories, everything he did seemed to come easily and naturally. I have a bit of a confession to make. 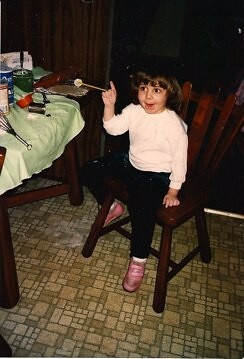 For the past 27 years, I've suffered a terrible, incurable affliction. I want people to like me. I know that we all do to some degree, but ever since kindergarten, I've felt an overwhelming need to be in everyone's good graces. If there was a new kid in class, I felt a gravitational pull towards the spot next to them on the reading carpet. I was the first to volunteer to walk them to the office and I'd run to stand next to them in line in the cafeteria. This tended to either work in my favor or make the poor newbie feel smothered and overwhelmed, or just annoyed that I was so friendly and interested in them. In fact, it seemed that the less someone was inclined to be my friend, the harder I tried to make them like me. It's no surprise, then, that when I got a blog, I thought it would be yet another outlet for me to try to be clever and charming and adorable and witty in hopes of winning people over and making friends. Some things are easier said than done. It turns out, some people are just better in person than on paper [or on screen]. I can't seem to shake the 6 years of studying Lit from my writing voice, no matter how much I try to write like I speak. I have more blogs on my Google Reader than I can count, giving me plenty of insight as to what kinds of posts will generate comments from readers. Try as I might, I can't seem to fit my voice or my posts to the formula. In fact, in the occasions that I have, it's been about as successful as the time I tried to befriend the new girl, Janina, by giving her one of my prized rocks from my collection, only to have her cast it off across the kickball field before recess was even over. Interestingly enough, despite my professed love of bacon and almost crippling dependence on eggs, butter and non-organic white sugar, I've received the most feedback on blogposts about vegan baking. Granted, one was a giveaway, but it garnered steady followers nonetheless. I've been told that, as a non-vegan, my recipes and posts are "refreshing" to read. In fact, they've even got me a spot guest posting on a vegan blog next month. Perhaps we're at our best when we don't try to be the best. Though to have friends we must first be a friend, I sometimes get so excited at the prospect of getting to know someone that I forget that no one wants to be friends with a smothery someone who is a little too eager to please. Likewise, readers aren't as likely to connect when they know a post is just reaching for comments. When I read blogs, I want to feel as though I'm hearing someone's voice and getting to know them through their writing. Reading a good blog makes me feel like I'm catching up with a good friend. So, for my friends who know me well and my readers who are trying to, I promise to be true to myself and true to my voice [when it escapes the chokehold of Academia it's currently under] even if it means crickets in the comments section.